Don’t let the title fool you; “best” is usually a vague term. Generally speaking, when it comes to high fidelity music reproduction from speakers, there’s a wide spectrum of speakers to choose from, including the likes of the Avalon Acoustics Tesseract, the Vivid Audio Giya G4, the Wilson Audio Alexandria, the Wilson Audio WAMM Master Chronosonic, the Steinway-Lyngdorf Model D and many others. To start with, they are all pretty large in size. But, this has a lot to do with physics. Reproducing music through the full spectrum of audio frequencies, so as to convey its full emotional and physical impact, requires not only the best electronics, but also large loudspeakers. To reproduce low frequencies, one needs to move a lot of air. Bass-rich musical instruments, such as double bass, organ, grand piano, are all pretty large. Similarly, to reproduce sounds to the scale of these instruments, most loudspeakers traditionally use large speaker drivers, built within large acoustic boxes. Consequently, most high-end loudspeakers aren’t suitable for personal living rooms, especially small ones. Secondly, these products usually cost a lot of money. The Wilson Audio Specialties Alexandria XLF loudspeaker, for example, costs around $200,000 a pair; the WAMM Master Chronosonic is priced at around $685,000 a pair, and so on. Most of these products, thus, cater to an ultra-premium group of audiophiles, who don’t have any budget constraints. These people aren’t just looking for a good music experience, they also want the most accurate rendition of studio recordings that a human ear can perceive. But, there is in fact one product in the market, which can easily compete against the traditional hi-fi loudspeakers that we’ve talked about earlier, and yet is almost 20X smaller in size, and more budget friendly. 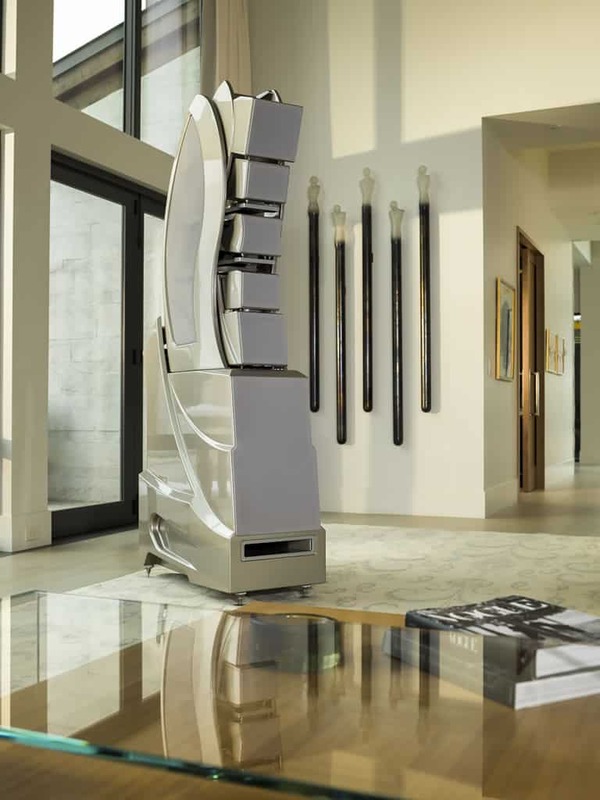 In this article, we are going to explore the Devialet Phantom, a series of high-fidelity audio speakers, that can sit comfortably in a living room of any size, and costs just over $6K a pair. 6 Is the Devialet Phantom for you? 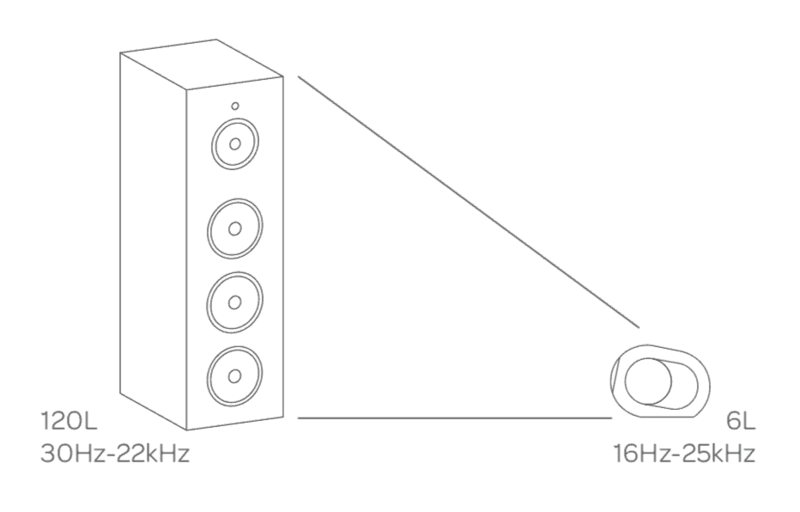 So, how does Devialet achieve this seemingly physics-defying feat of creating a speaker that sounds on par with, or sometimes even better than, the other ones almost 20 times its size? The Phantom is the result of over ten years of research and development, which includes more than seventy award-winning patents, and more than 100 patents altogether. Although built to be simple and elegant on the outside, the technology behind the way it works is quite intricate and sophisticated. 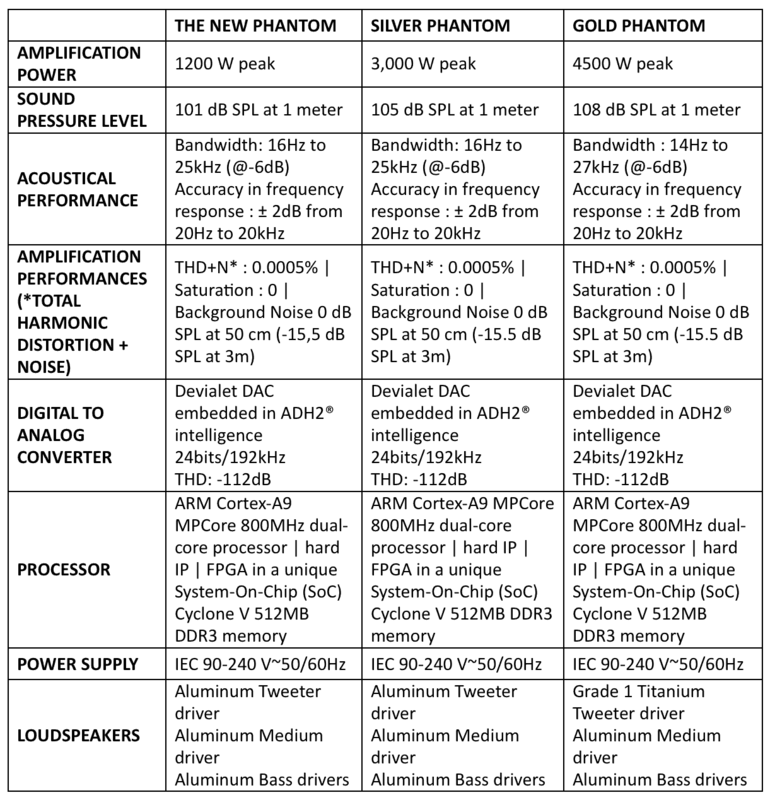 The working principle of the Phantom series of speakers, is outlined within the following core patented technologies. The idea behind ADH is to combine two opposed technologies of amplification — Analog and Digital — in order to achieve the best of both worlds. Analog (Class A) amplifiers produce near-identical outputs of corresponding original signals, but they also require a lot of power, and often generate significant heat, hence causing distortion. Digital (Class D) amplifiers are much less power hungry; they are compact, and give off little heat. Yet the signal amplified digitally is non-continuous and distorted. Even though sound engineers have spent years perfecting digital amplification, it is still far from reproducing signals accurately. ADH integrates the linearity and accurate reproduction of analog amplification, with the power-efficiency and compactness of digital amplification. The ADH consists of a genuine class A amplifier that is directly connected to the speaker, driving the output voltage. As a master, it controls the sound of the whole ADH core. An array of class D amplifiers, connected in parallel, provide the speaker with the current it requires to sustain the output voltage. They also minimize the workload of the class A amplifier, acting as slaves to the master. Due to the assistance of the digital amplifiers, the analog amplifier is relieved from delivering much of the power, improving the linearity of its output even further. Just ahead of the ADH amplification stage, is another component of Devialet’s patented technology. This one, termed as the “Magic Wire”, directly converts the output current from essentially one of the highest-performance DACs available in the market, into high voltage, without any processing in transit. This means that sound signal remains unaltered during the whole digital to analog conversion process. The ADH architecture is meant to deliver on Devialet’s promise of “Pure Analog Sound with Smart Digital Power”. It offers the musical qualities of a high quality analog amplifier, without its usual constraints of weight, volume and heat generation. The digital amplifiers provide substantial power to the analog one without compromising on the sound quality. On the contrary, it helps the analog amplifier to perform even better. The ADH architecture, as a whole, delivers the best performance in the market by a factor of 10 to 1000. The entire ADH core, along with the Magic Wire, is implemented into a single component known as the ADH Intelligence® ASIC (Application Specific Integrated Component). It provides an extreme level of performance and efficiency of amplification at 0.001% Total Harmonic Distortion, while reducing its size by a 200X factor, and its electricity consumption by a 10X factor. Transmitting the perfect signal to the speaker was the first step; making the speaker reproduce it perfectly was the second challenge. Musical instruments and voice produce variations in acoustic pressure that are recorded by the microphone. The role of the speakers is to reproduce these pressure variations. Every speaker is different based on various factors, such as size, architecture, driver excursion, etc. As a result, different speakers may reproduce different representations of acoustic pressure variations from the same signal. Hence, an identical reproduction of the original recorded signal is quite difficult. SAM is the signal processing mechanism that allows the ADH signal to adapt to the behavior of the very speaker it is connected to. Using a driver integrated into the dual-core processor of the Phantom unit, SAM deduces the exact signal to be transmitted in real time, taking into account the characteristics of the speaker and its acoustic load. This allows the speaker’s diaphragm movements to be driven more precisely, so as to obtain an exact alignment between the recorded music signal, and the pressure wave that reaches the listeners’ ears. The SAM mathematical model ensures extreme fidelity, which works across the entire spectrum of musical signals, all throughout playback, irrespective of whether you’re dealing with transients or steady-state signal. This enables the Phantom series to reproduce the exact rhythm and tempo in your music, with extreme precision, so you can experience it through every emotion, just as the artist intended. The third challenge was reproducing the whole audible spectrum (and beyond), within an enclosure roughly the size of a bowling ball. This was a technical challenge that went against the general laws of physics. And it’s one of the challenges that we have highlighted previously in this article, the very reason why high quality speakers are usually huge in size. In order to reproduce low frequencies, one needs to move air; big sound requires big loudspeakers. The Devialet team implemented an acoustic chamber within a maximum volume of 2 x 3 = 6 liters, so as to keep the Phantom’s form factor compact. This, of course, presented many realization challenges. One of the significant ones being, the maximum air pressure inside the enclosure would be 20 times higher than a conventional speaker box. This is equivalent to a Sound Pressure Level (SPL) of 174 dB, which is the acoustic pressure level associated with a rocket at launch. In order to create lifelike bass from such a compact enclosure, the Phantom speaker drivers needed to be able to create and resist extremely high pressure and vacuum inside the speaker box. 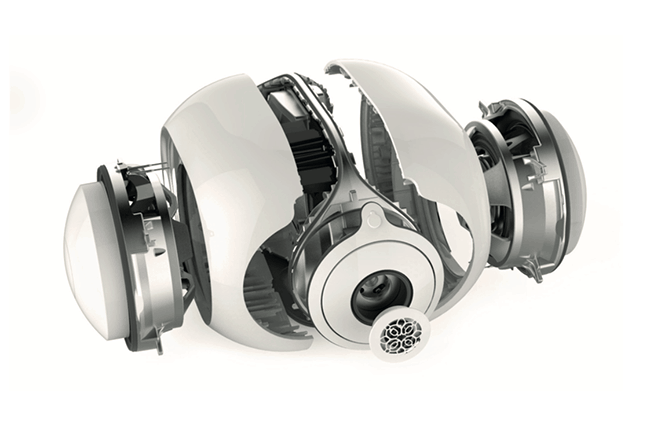 The result is a unique, high-efficiency woofer, with a long stroke (26 mm peak-to-peak), and yet, a compact driver. The Phantom’s hermetically sealed architecture consists of two lateral woofers powering together. The gasket that seals off the woofer enclosure has a diameter of 2.62 mm, and is compressed by a force of 1.2 tons. The sheer thrust behind their combined movement generates ultra-dense sound with physical impact, right down to 14 Hz. ACE refers to the Phantom’s uniquely cospherical conception. Inspired by the acoustic principle of Olson’s pulsating sphere, the Phantom optimizes the way sound waves form and travel along every direction. The Phantom’s functional design guarantees balanced, multi-dimensional sound distribution with zero surface diffraction. The EVO Platform enables a Phantom to receive performance and compatibility updates wirelessly over the air, for a lifetime. The EVO® electronic architecture is driven by permanently upgradable software. Connect the Devialet Spark app on your iOS or Android device to your Phantom speakers and let the app take care of the rest. The Phantom, at the time of this writing, is available in three variants. The New Phantom delivers a peak power output of 1200 W at 101 dB SPL, with a frequency range of 16 Hz to 25 kHz. The Silver Phantom provides a peak power output of 3000 W at 105 dB SPL, with a frequency range of 16 Hz to 25 kHz. The Gold Phantom (which is also the best of the lot) delivers an incredible peak output of 4500 W at 108 dB SPL, with a frequency range of 14 Hz to 27 kHz, and also includes Titanium tweeter for better high frequency response. The below table captures the technical specifications of each product in detail. The Phantom is accompanied by a range of premium accessories to augment its usability and experience. These accessories range from a high-fusion “Treepod” stand; a smart stand called “Tree” for elevating the Phantom to the ideal height; a premium Remote for precise volume control, a designer wall-mount for the Phantom, called “Gecko”; an intelligent hub called “Dialog” that provides network stability and enables syncing across all the Phantoms within your home, to the Cocoon, a high-tech carry case for the Phantom. The Phantom is tailored to suit the user as per their requirement. A single Phantom playing solo, is an immersive, emotional experience, incomparable to any system this compact. In a duo arrangement, this experience is only made more powerful by adding a new dimension to the sound; an immersive audio experience, in stereo. In larger rooms, such as a hall or a gallery, you can even setup up to 24 Phantoms together, in order to create the ultimate immersive experience, without limits. Set up your own immersive room, or create a multi-room experience. 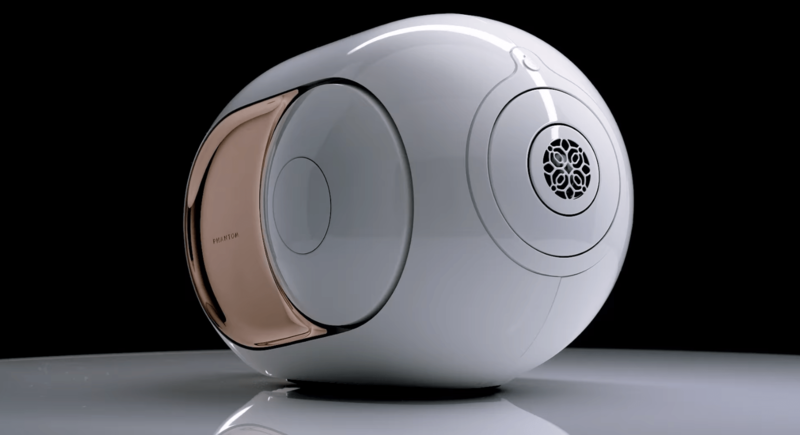 The Devialet New Phantom (basic model) costs around $1,690 per unit; the Silver Phantom is priced around $2,300 per unit; the Gold Phantom, which is the best Phantom available in the market, is priced at around $2,990. Each purchase of a Phantom product includes free international shipping (courtesy of UPS), and a free three-month Tidal subscription, letting you stream the entire Tidal library in CD-quality sound. You can optionally include the Devialet Care warranty and insurance cover for your Phantom worth $299. The Devialet Care plan offers a three year guarantee covering up to two instances of accidental damages, each of them subject to an additional service fee of $299. Every purchase of a Phantom also gives you the right to return them within 14 days of purchase or delivery. Once Devialet receives the items in time, it will issue you a full refund (Terms & Conditions apply). Is the Devialet Phantom for you? That entirely depends on your expectations as an audiophile, as well as your budget. If the Phantom exceeds your budget, you can even choose from more budget friendly hi-fi speakers, such as the Klipsch Forte III, RP-150M, etc. There are also decent options available in the Wireless speaker (JBL Xtreme, Boombox, the Bose SoundTouch III, etc.) and the smart speaker (Apple HomePod, Sonos, etc.) categories. Visit the official Devialet website for more information on the Phantom range, and more. And if you’re interested in the technical implementation of the product, you can read their whitepaper for a more detailed explanation.